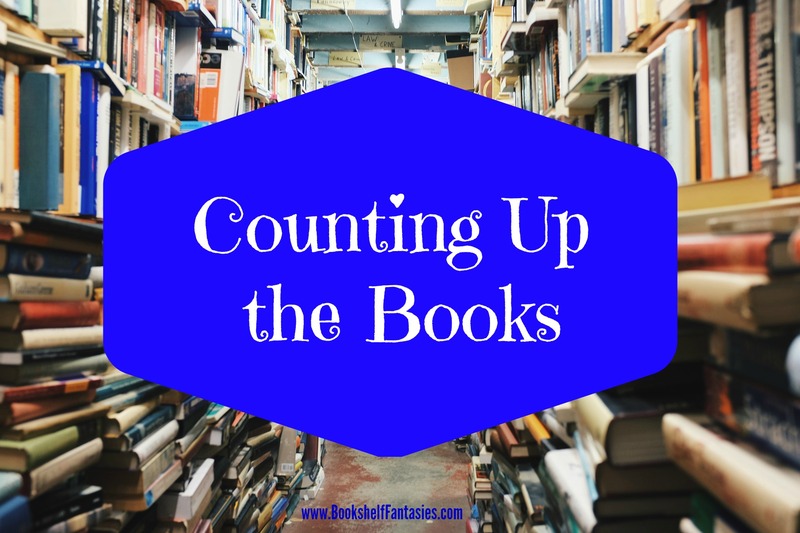 This past fall, I wrote a post called Counting Up the Books, talking about two things I love: BOOKS and NUMBERS. That was the beginning of a monthly feature for me, in which I tally up just how many unread books there are in my house and on my Kindle. You’ll notice that my numbers went up, not down, for a few months there, until finally in January we have tiny baby steps of progress in getting the numbers under control. In thinking about this book count methodology of mine, I’ve started to reach the conclusion that my approach is a bit flawed. In general, when it comes to my reading habits, I try to avoid absolutes. I don’t participate in challenges. I don’t view my resolutions as rules, but rather, as aspirations. And I would certainly never put myself on a book buying ban. Why set myself up for failure? I know I won’t give up buying books for a year, and I won’t even pretend that that’s a realistic expectation. I am, however, making a conscious effort to request fewer ARCs and preorder fewer new releases — largely because I know that I already have a huge backlog of books to be read. Even when a brand new book arrives hot off the presses, I don’t always read it right away, so why do I need to buy it the second it comes out? All that said, I think if I want to track my progress with reading my shelves, I need to have a fixed baseline as a reference point. And so, arbitrarily, I’m taking my January numbers as point zero. Going forward, my Counting Up the Books tallies will not include newly acquired books. Yes, I’ll keep track of my new arrivals (hurray, a good excuse for another spreadsheet! ), but I’m going to use my January count as my 2016 point of departure. 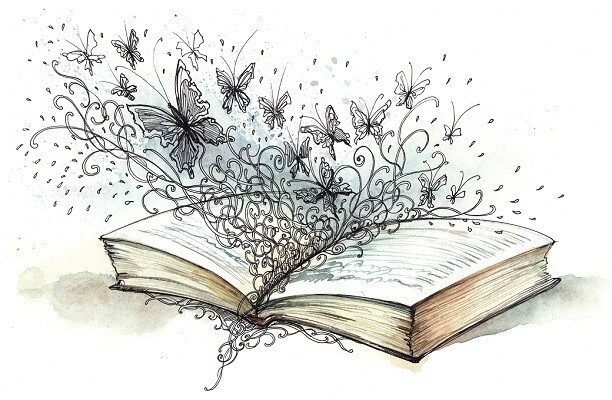 Of the 548 books that are on my list as of January, how many will I actually read in 2016? And how many will I give away, sell at the used bookstore, or donate to a good cause? We’ll see. I’ll be posting a fresh book count at the beginning of each month to track how I do… and at the end of the year, I’ll do a re-count — or hey, I like the word recalibration! That’s it: At the end of December, I’ll recalibrate my book count to add in any new and still unread acquisitions from 2016, and start with a fresh baseline number in January 2017. Make sense? So… like I said — baby steps. How are your shelves doing this month? 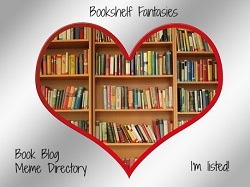 Don’t forget to join me for Shelf Control on Wednesdays, where we highlight books from our shelves that we really want to read! 130 Books on my “shelf”. More like pile on the floor cause I have no room left! Ha, I use the term “shelf” pretty loosely! Piles on my dressers, a stack on a spare chair… wherever there’s room, there’s a pile of books! That’s just about how my entire apartment looks! Yeah, I know what you mean… There are books I just have to have, but I do feel that I’m at least being a tiny bit more selective about what I buy and when. 🙂 A big plus for me is getting out of the habit of requesting ARCs. I definitely have more time to read whatever I feel like now! Good luck on keeping the number down!!! Thanks! Some of these books I’ve had forever, but I just can’t part with them! I’d never do a count like this because I’d find the numbers too depressing – sad but true! LOL. But like you, I’m trying to cut down on pre-orders this year and read my way through books that I already own. My big issue here is that I have quite a lot of ‘book 1’ trilogy/series books and when I read them I then end up buying the next book… lol. I get it 🙂 — those series are so hard to put down once you start! Counting actually helped me, because it motivated me to pull out the books that I’ve had for years and never actually feel like reading — and donate them! It takes courage to put a number on your “unread” pile. My to-read shelf on Goodreads is over 200 books, not counting all the physical books on my shelf. Wow! I like this idea. Maybe I can do it also. 😀 I have 200+ in my shelf as of now. Last count, 80% is to-be-read books… and I’m trying to convince myself not to buy new books for now. Good luck to your goal! Thank you! At first I thought it would be depressing, but I’m actually finding that it’s really good motivation to look at my shelves first when I’m ready to start a new book. I am a year long book buying ban although I built in some wiggle room (allowing myself 6 book purchases so that I can read/buy the Stella Prize shortlist; and allowing myself 12 ARCs so that I do have the opportunity for some new releases). 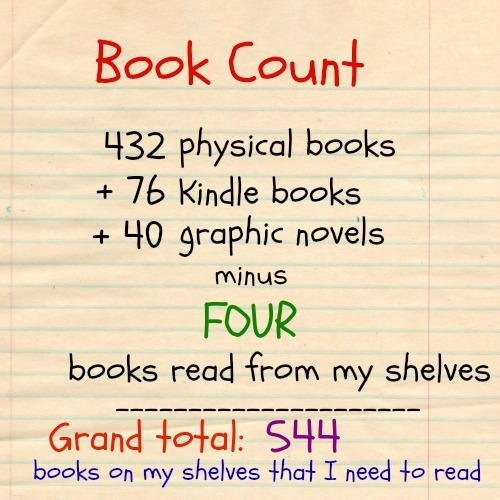 I started at approx 425 books and I’m down to about 417. Not great but no new books. I do plan on not reading some of that 417 – there are books there that have been there for years and I suspect no longer of interest. Wow, I like your approach! It makes sense to give yourself an allowance of new books and ARCs, and it sounds like you’re making progress! 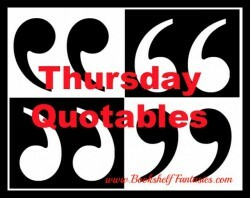 I have not totaled my tbr numbers (I really don’t want to know! ), but I am making a concerted effort to read the pile down this year. Last month, out of the 15 books I read or listened to, 9 of them were from my shelves. Feeling good about that, and hoping I can continue it. I think all will be well until BEA hits in May…….and then I’m in trouble again! I wish I could go to BEA! It’s kind of fun, isn’t it? I appreciate the support! Doing this counting project has made me more excited about some of the books I’ve for a while (which other wise I probably wouldn’t glance at again.) Like you, I think I’ll end up doing a bit more culling, but it’s a push/pull kind of thing, where I have to convince myself to part with some books that I’ve just kept holding onto! I don’t think I could fit 400 books into my apartment… I like your new approach of accounting for how many books you read from your shelfs too. Thanks! I’m trying to stick with it, but I get sooooo tempted by new books!